Track 1 of 5. Childhood in Leiston. After school gathering horse muck. Left school 1944 .First job Red House Farm Leiston for Mr.Tyrell. Worked with heavy horses. Left 1960 to work for Mr. Bill Smith of Knodishall, land gang work. Working with horses. Feeding, grooming and breeding. Length of days’ work and conditions. Decline of horses. Changed job in 1987 to building trade, but met Heavy Horses again whilst working for Reades of Aldeburgh. Track 2 of 5. Meeting with Roger Clarke and Paul Heiney to help with Heavy Horses. Childhood life at home. School in Leiston. Discipline, war time at School. Track 3 of 5. Christmas at home, summer holidays spent on farm. Living off the land. Ferrets and dogs. Labouring for Reades at Redhouse Lane Leiston, banter in the building trade. Track 4 of 5. Working at the brick works in Aldeburgh. 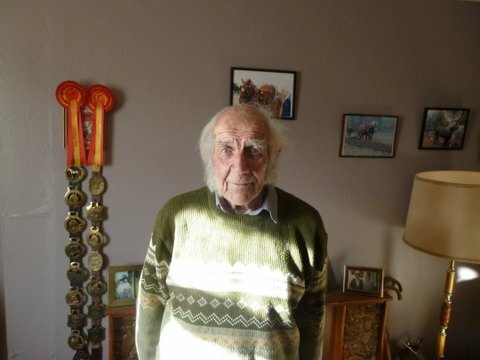 Retirement: pigeon racing, working with horses. Track 5 of 5. In retirement working with Paul Heiney and his horses. Conscription. Discipline at home, Mothers cooking, clothing. Marriage. Knocking off time at Leiston works Engineers Pub. Leiston Hall Farm.